At Sunset Hill Stoneware, we make unique coffee mugs for a truly diverse array of customers, from first responders and rock bands to coffee companies with a tougher vibe. Somewhere in the mix, however, there's a completely different set of clientele to whom we provide essential fundraising tools. 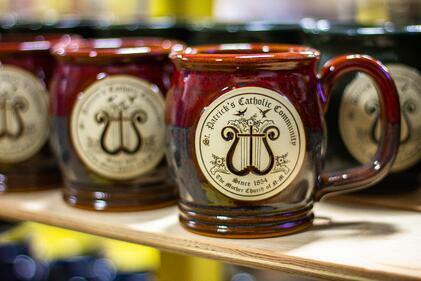 Sunset Hill Stoneware has supplied mugs to religious orders and organizations of all kinds for more than 20 years. We're glad to work with any religious group regardless of denomination or creed, but here are a few highlights that have come through our shop within the last few months. Serving the Neenah and Menasha, Wis. communities, St. Patrick's Catholic Community has been open in one form or another for more than 150 years. Named for the patron saint of Ireland, St. Patrick's was the religious cornerstone for Irish and German Catholics during the earliest years of its existence in the mid-19th century. The community still has active participation today at its primary church in Menasha. Seeing how close St. Patrick's is to our business, being just across the Fox River, it's only natural that we would collaborate with the parish to provide them with mugs to support their fundraising efforts. Sporting the Happy Soul in Cranberry Bog, the unique coffee mugs we made for St. Patrick's Catholic Community feature the shapes of a lyre, a western Christian cross, flowers and swallows, a possible homage to the saint for which the community is named. Located in Wake Forest, N.C., Southeastern Baptist Theological Seminary is large compared to other seminaries in the United States, with thousands of students enrolled. The seminary offers master's and doctorate degrees in areas such as ministry, theology, religious education and many more different programs for aspiring pastors and ministers. One of the focal points of the seminary's campus is Binkley Chapel, a large chapel where students attend regular services. 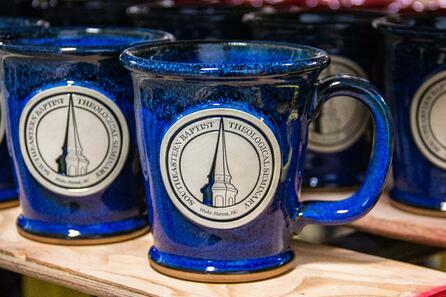 The historic chapel with its dramatic, white spire serves as the inspiration for the unique mugs Southeastern Baptist creates with us, with the spire's point breaching the inner circle on the mug's medallion. Sunset Hill Stoneware supplies mugs to Southeastern Baptist Theological Seminary so the school can raise funds through its bookstore. The first few mug styles and colors that the seminary ordered featured a few different shades of blue, with the most recent addition to the collection including the Morning Rambler in our electrifying Blue Moon glaze. These mugs are a great way for any student, faculty or visitor to show pride in the seminary, all while supporting the organization and its goals. With a more contemporary vibe, HopeNYC is a Pentecostal church based out of Queens, N.Y. that serves hundreds of people each week. The church has an active social media presence and regularly posts updates on its YouTube channel so congregants can stay up to speed with events and services. HopeNYC turned to us to create a stylish, high-quality coffee mug to support its efforts to foster a thriving community in New York City. 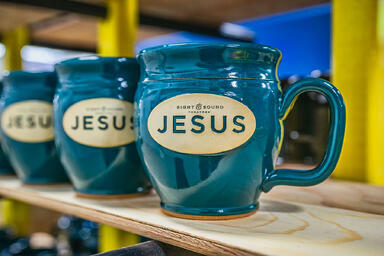 Proceeds from the church's mug sales benefit congregants and community activities in which the church participates. For its premiere mug in 2018, HopeNYC went with the simple but sophisticated combination of a Potbelly mug in our Midnight Black glaze. 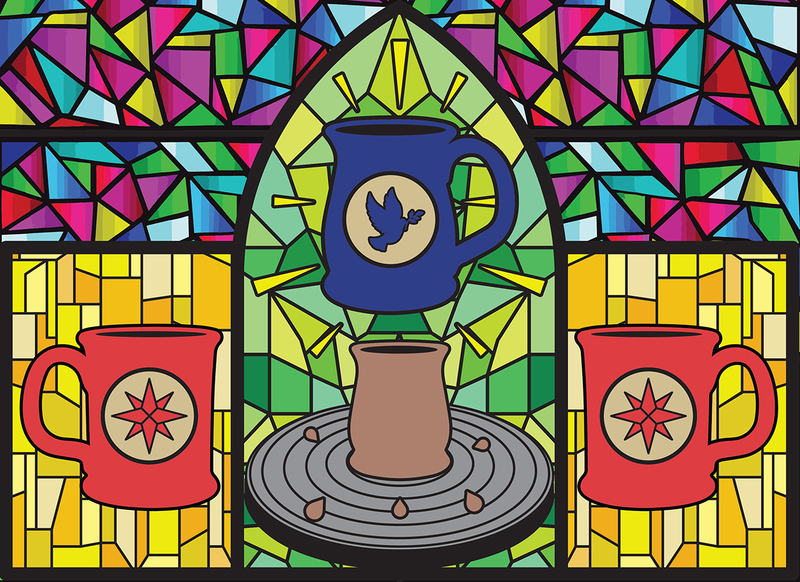 The mug features a compass design on the interior of the medallion, representing the church's and God's desire to guide people through life. To the best of our knowledge, these mugs are available by contacting the church directly. A large theatrical production company, Sight & Sound Theatres depicts stories from the Bible on stage in Lancaster, Penn. and Branson, Mo. to thousands of people each year. Sight & Sound features high production value performances of various stories from the Old and New Testaments, including depictions of Moses, Samson, Jesus and Esther, among others. These performances include a panoramic set, dozens of actors and crew and frequently involve live animals. We've made thousands of mugs for Sight & Sound Theatres over the past few years alone. 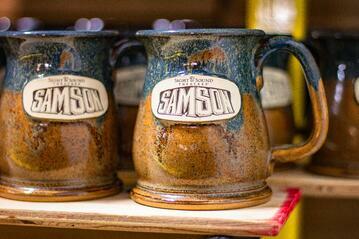 One of our favorites include the Samson mug, with its rugged lettering and rustic Copperhead Run glaze to match. Seeing as it comes in one of our rarer glazes, the Heritage Green mug we made for the theater's production, Jesus, also deserves recognition. As the company develops more plays and musicals in the coming years, we look forward to providing mugs for its guests to commemorate their experience after they've left the theater. 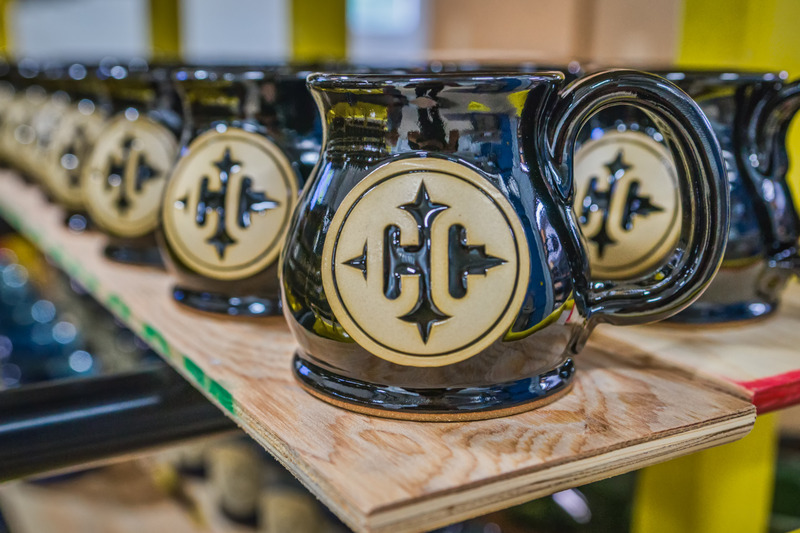 Countless other religious organizations use Sunset Hill Stoneware's unique coffee mugs and custom beer steins as tools for fundraisers to support their activities and causes. Find out the basic steps to running a fundraiser for your organization with our handy guide at the link below.